Projecto JAVA - Quem Somos? JAVA is a non-profit organization founded in 1999 to fight for the welfare of abandoned dogs. It arose from the will of a group of people who like animals, taking them from the dangers of the street. The Association shelters them, watches over their health, treats them, seeks to control the litters, as well as new owners, through sterilization and adoption campaigns, respectively. Located in Lourinhã, Lisbon district, approximately 45 minutes from the capital, with access via the A8 or N8. In partnership, the Lourinhã municipality ceded a plot of land, in which the JAVA kennel was built, which seeks to be improved annually, enabling the shelter of animals in the best possible conditions. 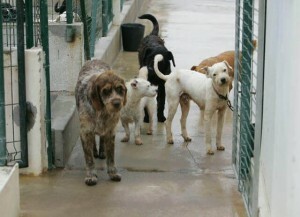 At the moment it receives about 190 animals: females, males, puppies, of all races and ages. The Association maintains its facilities, veterinary treatments, food and hygiene procurement, which survives with the quotas of the members who pay them and the benefactors who contribute. In addition to an official loaned by Lourinhã City Hall, JAVA counts on (few) volunteers, who are essential in collaboration with the Association. We treat and care for all, so that they regain their lost dignity by being abandoned, left in a ditch or attached to a pole by a cord. The sterilization of female dogs is one of the priorities, in order to minimize the scourge of the abandonment of animals in Portugal. It is an unequal struggle that every day JAVA gives voice, fighting for those who do not have it and therefore can not complain, of who insists on mistreating them, through the most horrendous forms. In many cases it is not just the adoption of an animal that counts, it is also the respect and dedication to which you have the right, as a living being. We can not forget that many animals are abandoned by those who have seen their lives saved, thanks to the help of an animal, but nevertheless did not know how to return the proof of friendship. Our kennel is oppened from 9:30 a.m. to 12:30 p.m. every day including Saturdays, Sundays and holidays. We advise the weekends to make adoptions. Visit us!